A Website for Gay Men Covering News, Pop Culture, Health, Wellness, Movies, TV, Music, Podcasts & More! The number of anti-gay hate crimes, particularly violence against gays, increased dramatically in 2008, according to new figures released Monday by Statistics Canada. I have written about the increase in gay bashings before, I'm not surprised by these latest figures. It is becoming more evident that the increase in violence is due to the increased visibility of the LGBT community. Police services are reporting a big jump in hate crimes, and they say gay men are being targeted more often and in the most violent incidents. The agency said police logged 1,036 hate crimes in 2008, up 35 per cent from 2007. Just over half (55 per cent) were motivated by race or ethnicity, 26 per cent by religion and 16 per cent by sexual orientation. The agency says all three major categories of hate crime increased in 2008, but the largest increase was among crimes motivated by sexual orientation, which more than doubled from 2007 to 2008. Hate crimes motivated by sexual orientation were also the most violent: 75 per cent were violent compared with 38 per cent of racially-motivated incidents and 25 per cent of religiously motivated incidents. 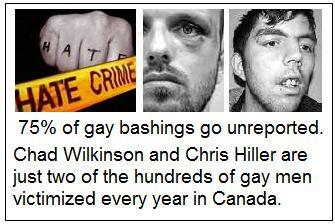 Among violent incidents motivated by sexual orientation, 85 per cent of the victims were male. Police reported 143 hate crimes in Vancouver in 2008, nearly double the total from the previous year. There were 271 hate crimes reported in Toronto, a rate of 5.4 hate crimes per 100,000population. Montreal, where police reported 38 hate crimes in 2008, had the lowest rate, at one per 100,000. "We've known for years and years that we have a big problem with violence against the LGBT community . . . and I don't think the government can continue to sweep this under the carpet and say that we have great legislation in Canada to protect LGBT communities (when) the reality is that we're not." The Statistics Canada figures suggest young people between the ages of 12 and 22 are responsible for six in 10 hate crimes; the majority of those accused being 17 or 18. Kennedy said that's consistent with Egale's own research and suggested efforts to reverse this alarming trend need to begin in schools. Teachers need to be better trained in how to deal with anti-gay incidents that arise in classrooms and school corridors and young people need resources to be able to defend themselves and speak openly, she said. "We need curriculum that reflects kids with queer parents . . . We need curriculum that addresses the LGBT community through history," she added. "There's a ton of work that needs to be done in this area." Share this article on your social media. Brock O'Hurn... Will You Be My 'Santa Baby' And Hurry Down My Chimney Tonight? What Happens When A Romantic Interlude Suddenly Goes Awry? Visit the Stonewall Gazette 'About' page here to learn more. Stonewall Gazette does not claim ownership over some of the images and written material posted, other than that which is identified as the property of Stonewall Gazette (read our Notice of Copyright). The images and written material (other than that which is identified as the property of Stonewall Gazette) remain the property of their respective owners and have been used on this site in good faith as we believe it falls under the legal term of "fair use" (read our Legal Disclaimer). If you are the legitimate owner and wish to have an image and/or written material removed, please send an email to the Editor. Contact information here. Thank-you.